Lately I have been interested in just how people are spending their summers. Do you spend it hanging out on the couch watching reruns or do you get out and do something active? Do you make it a habit of traveling to a new place or do you stay at home and make the best of it? I have seriously become fascinated with how people are living, or not living, their lives. For the first few weeks I was in Alaska I was doing excursions and brewery tours almost everyday. It was insane. And yes, an insane amount of fun. I didn’t give myself enough time to write though and became a bit back logged. For the last two weeks I have holed myself up in Anchorage and have worked some serious hours fighting my way out of being so incredibly behind. I made a good dent, but I still need to put in long hours while here in San Francisco. Even being out of Alaska for just a few hours I already know all the things I want to do when I get back. I want to finally go ice hiking with Exit Glacier Guides. I would like to go fishing out on a charter boat and out on the Kenai River, for sure! I might even hit small balls out at the golf course in Anchorage – because how many people can say they went golfing in Alaska? 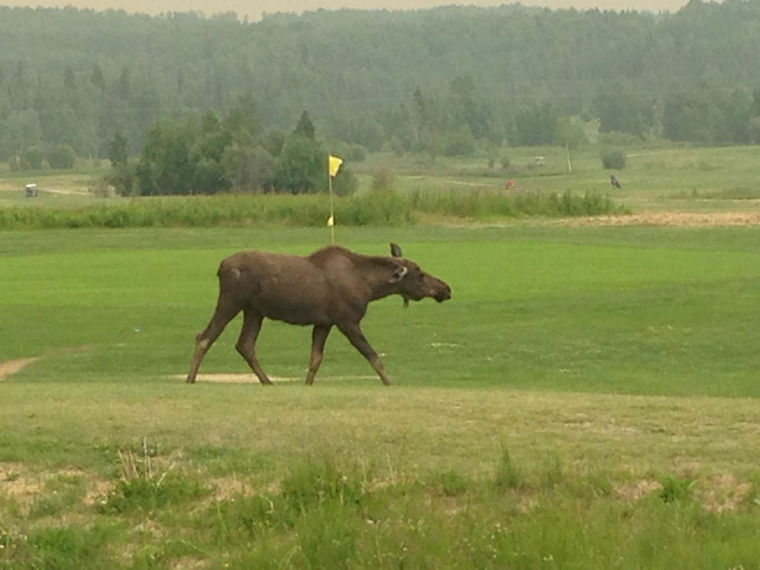 Seriously, would love to see a moose on a golf course!! Now I am not a golfer by any means, but I want to try everything, nothing is off limits. One of my fellow travel bloggers went golfing at the Boca Pointe Country Club in Boca Raton, Florida, and it made me miss hitting the little balls. I was supposed to get back to Florida this year, but not sure if that is going to happen. What I realized though is – I just want to be active. Whether it is golfing in Florida or hiking mountains in Alaska, I want to be outside. So incredibly gorgeous… golfing in Boca Raton doesn’t look half bad at all. So what are you doing this summer? Be truthful, tell me. Maybe I will add it to my Must Do List! Disclosure: Links within this post may contain affiliate links that I earn commissions from. Example, if you click on the above Complete Outdoor Encyclopedia link and purchase anything from that site I make a small commission, no matter what you purchase. This is how I pay for my travels and this blog. Thank you for supporting me!